Many centuries ago the human race began to colonize worlds other than Earth. An exploding population combined with an international hunger for the untapped resources of new worlds led to mankind’s rapid expansion beyond Earth’s solar system and out into the rest of the galaxy. The desirability of potential colony worlds varied widely based on location, natural resources, atmosphere, size, etc. Not surprisingly, this led to tensions and even outright conflict between interested parties, whether they were nations, corporations or other organizations. This led to the militarization of human space. Given the great distances involved and evolving political landscapes and interests, many colonial governments changed. Some shifted allegiances based on common cause or common interest, while many formed independent governments. Of course the driving forces behind most of these changes were the same as ever: money and safety. Those with enough money formed organized space navies; initially this was for protection and influence over each other. It’s not clear what first drew the hostile attention of these mysterious aliens, but most historians agree that it was in some way triggered by the non-stop expansion of human space, presumably towards Blob territory. While little was known about the organization and political structure of the Blobs at the time, they clearly had a united purpose as regarded humanity. Unfortunately for humanity, they were unprepared to present a united front against a major outside threat like the Blobs. First contact with the Blobs came in the form of several of humanity’s outer colonies being completely obliterated by fleets of mysterious organic looking ships armed with weaponry that was far superior to that of the fledging regional human space navies. As various colony worlds and political entities sought protection and aid from their more powerful and better equipped trade partners in the human core worlds, they were disappointed with the response. The great distances involved, long standing political differences and short sighted corporate greed resulted in little support from the core worlds, which were now ruled by a single corporate empire, which was more focused on profits than on human lives. Indeed, news of the alien threat caused further escalation and expansion of the core worlds’ space military, but little to none of it was sent to the aid of the outer worlds that were under the greatest threat of Blob attack. It was about this time that history saw the rise of a planetary administrator turned warlord, Pierre Martine. Martine had already organized one of the biggest and most modernized space navies in the outer colonies, but his rise to power spiked dramatically with the arrival of the Blob menace. Now smaller colonies became quick to swear allegiance to Martine in return for a unified defense from the Blobs. 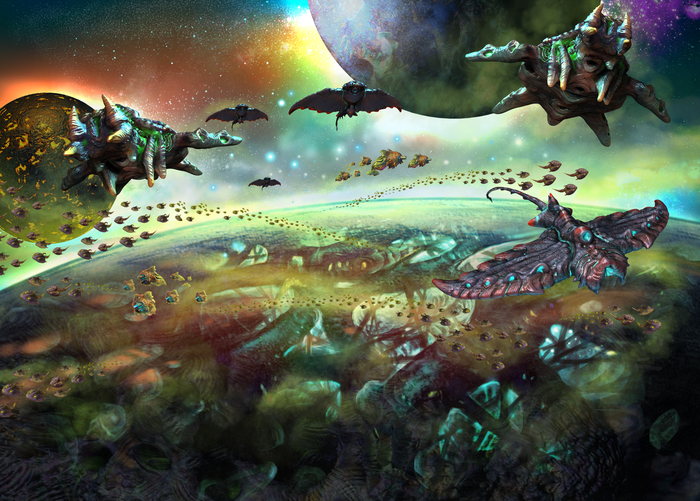 While independent outer colonies continued to get wiped out by the silent and brutal Blobs, the worlds protected by fleets of Martine’s rapidly expanding space navy were largely avoided by the dreaded alien ships. This only added to the rush to swear allegiance to Martine and his rapidly expanding empire. Soon over a third of human space was under his “protection”, which he formalized into the “Star Empire” with the announcement of his assuming the title of Emperor Martine. In just a few decades, Martine had become the sole ruler of far more territory and subjects than anyone in human history. The Star Empire continued as a united empire under his oldest son, Lucien. Pierre Martine was a brilliant administrator and strategist as well as a long term thinker. He balanced the needs of the various worlds under his control, while at the same time ensuring his planetary governors all understood they owed him their complete loyalty and fealty. He raised Lucien with an understanding of the principles and strategy needed to keep the empire intact and even thriving, if not continuing to expand. Rather than waiting for his death to leave the question of leadership in doubt, Pierre chose to retire when he felt Lucien was ready to rule, thus providing a smooth transition. While the outer worlds of humanity all came to be ruled by a single individual, the government of the core worlds was quite different. What started out as an alliance of nations from Earth trying to colonize into space, quickly became replaced by an alliance of wealthy corporations, as nations became unable to finance the rapid expansion out into the galaxy. In space the naval and economic might of corporations quickly dwarfed and then replaced that of the former Earth-based political entities. Without a political entity powerful enough to stop mergers and monopolies in space, these corporations eventually formed a united corporate empire that controlled the majority of human space. This was called the Trade Federation. For many decades human historians viewed the galaxy as being completely divided up between these three groups: the Blobs, the Star Empire and the Trade Federation. What they didn’t realize was that there was a fourth major force gathering power in the galaxy: the Machine Cult. The Machine Cult started as an alliance between two major mining and manufacturing colonies that had been cut off from the rest of human space when the Blobs began hostilities with humanity. No human researchers know for certain why these two colonies survived initially, when similar colonies were being eradicated by the Blobs, but the colonists didn’t wait around hoping for their luck to hold. The head of the industrial workers union on the two allied colonies, Thor Bowerson, led a movement that preached that they were a chosen people due to their survival. He preached that they had been abandoned by the rest of humanity and that they had no choice by to embrace their industry if they hoped to survive on their own, cut off from the rest of the known universe. As fear of the Blobs and resentment of their colonies’ seeming abandonment by the rest of humanity spiraled, Bowerson’s “Machine Cult” took power in a near bloodless coup. The focus of Bowerson’s movement became building a highly mechanized space navy of a size that far exceeded the size of a traditional space navy that their population would normally have been able to support. Thanks to the massive quantities of mineral resources and manufacturing on these two colonies, this turned out to be more achievable than any so called “experts” from the rest of human space would have anticipated. As they pushed to quickly build up their navy, they began to suffer sporadic Blob attacks. This environment of threat and desperation helped lead to a culture of military focus and of dedication to the goals of the cult. The Cult preached survival through technology, which eventually led to worship of technology itself. Over time, the Machine Cult expanded to other nearby worlds and the reasons for starting the cult faded, while dedication and fervor for its ideals increased. In recent years the Machine Cult has come into contact with the rest of humanity, but shown no interest in becoming a member of either the Trade Federation or the Star Empire, despite pressure from both of those parties to do so. 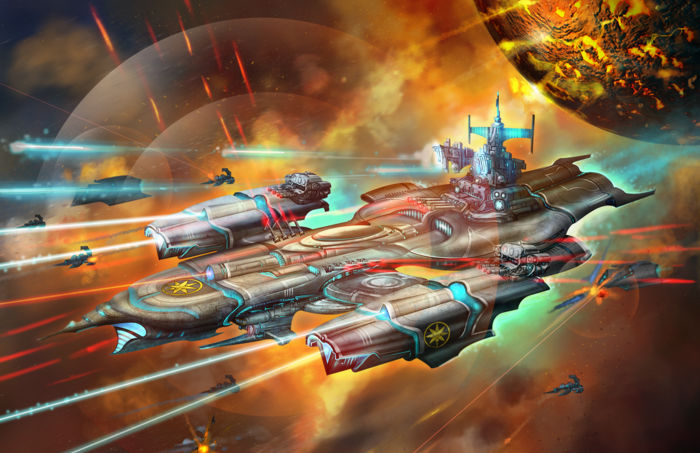 While they lag behind the other major star realms in population, the Machine Cult makes up for it with a technologically advanced, relatively large and largely automated space navy, as well as with their religious and military zeal. Given the success of the Machine Cult and The Star Empire with breaking free from the Trade Federation and creating their own independent political entities in spite of and in part because of The Blobs, sometimes others are tempted to try and carve out their own star realms on the outer edges of settled space. This is usually only possible with the cooperation of or at least the tolerance of one or more of the existing factions. 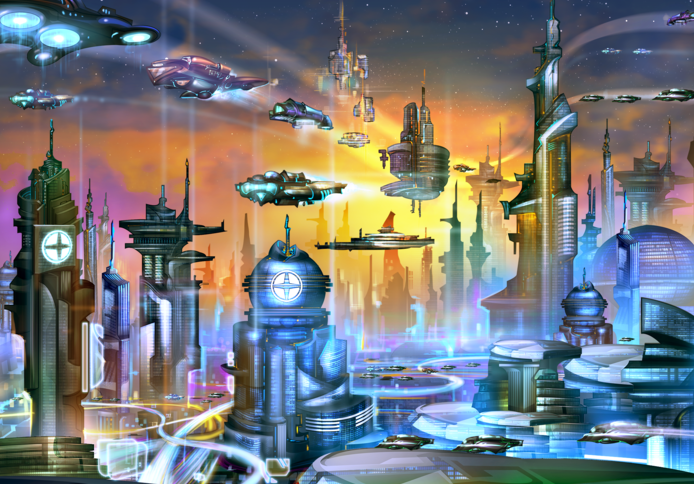 As trade intensifies and colonists and settlers are enticed away from the existing star realms, friction inevitably happens, sometimes with the four main star realms and always with other new, competing, emergent realms. War soon follows. So far no new star realms have emerged successfully since the Machine Cult, but that doesn’t stop people from trying. Even various factions from within Blob space have been known to throw their lot in with humans seeking a new start and a new realm. Space is vast, but good colony worlds and worlds with good natural resources are at a premium. This is your opportunity to try and form a coalition of space farers trying to establish your own new star realm. Another emerging star realm has its eyes on the same territory as you do though. 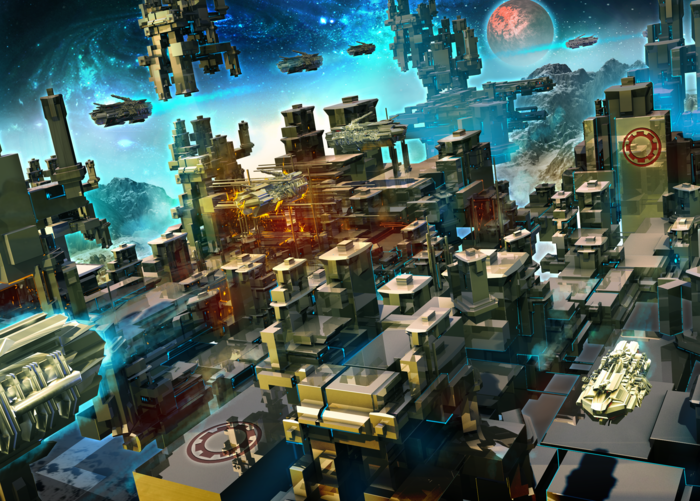 Now you must quickly trade for the ships and bases you need to fight for the very existence of your star realm. Will you succeed in this all-or-nothing space race and emerge the victor?